Thapar University Recruitment 2018 Updates: Check here Thapar University Recruitment 2018 online in coming days till you may view old orders. 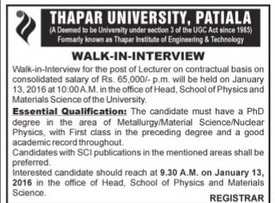 Earlier Thapar University, Patiala conducts interview for Lecturer post on contract basis. Interested candidates have to attend interview as per official dates. The thapar university recruitment notification is published at…………..http://www.thapar.edu/............. More needed information of Thapar University Recruitment 2016 regarding qualification, salary and application process etc is mentioned below……………. Earlier Thapar University, Patiala invites applications for JRF/ SRF work on CSIR sponsored project. Interested candidates have to apply online on or before 05 August (now over). Candidate should have master degree in chemistry with 55% or equivalent. Thapar University, Patiala (Declared U/S 3 of UGC act 1956) will issue job notice for Teaching & Non Teaching Staff posts. Earlier it invites online applications for Head Placement, Medical Officer, Manager, Executive and Sports Coaches Jobs. 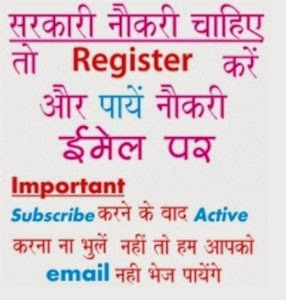 Interested aspirants have to apply online on or before 24 December 2014. 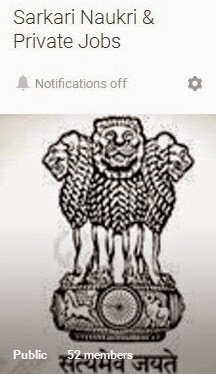 The notification is available at…………. http://www.thapar.edu/............. More information of Thapar University Recruitment 2015 regarding eligibility, qualification, experience, pay scale and how to apply etc is mentioned below……………. The positions other than coaches initially for 03 years and extended further on mutual consent based at Patiala and Coaches shall be appointed on contract for 01 year initially.